"In the right room acoustically, the Eroica is felt through the feet, against the belly, and, if one sits on the floor, it ripples through his bottom. It is very difficult to put on tape, and especially on records, with any fidelity. Adequate playback equipment is absolutely essential, which means that the poorer generally are not privileged to experience a rippling though their backsides by an art form." Powerful deep-bass response means more than just pure tones. Rather, it requires raw power, tactile surges of air pressure, and a mix of the senses of hearing and touch. To move the amount of air required, subwoofer devotees have opted for large enclosures housing big drivers. When Mark Levinson set about creating the HQD—his ultimate, $80,000 two-channel audiophile system—he built two 24" Hartley drivers into huge credenzas. In my listening room, I've reviewed subwoofers whose large, dense, cubical cabinets weigh more than 150 lbs. More recently, much smaller powered subwoofers have become popular for home theater systems. These use powerful internal amplifiers, lots of equalization, and servo correction to generate deep bass. When James Loudspeaker offered me a chance to review one of their bandpass subwoofers, I eagerly said yes. Although I began reviewing the smaller James EMB-1000 ($1595, see Sidebar, "The James Loudspeaker EMB-1000 subwoofer"), the EMB-1200 was made available to me in the middle of my auditioning. Because the larger sub seemed better at moving air in my large listening room, I decided to make it the subject of this report. Measuring just over a foot wide and tall and a foot-and-a-half deep and weighing 75 lbs, the EMB-1200 ($2195) is about half the size and weight of the Velodyne DD-18 subwoofer, with which I compared it and which I reviewed in June. The EMB-1200's build quality is satisfyingly robust, and it's finished in a shiny black Piano Gloss or in Black Granite. A 12" passive-radiator diaphragm of spun aluminum sits in front, set off by 18k-gold hardware accents at each corner. The heavy passive diaphragm and the carefully sealed enclosure rule out the chuffing and wheezing noises that can be heard from some ported subs. 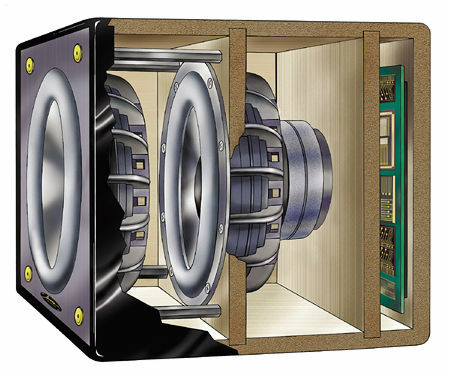 The interior of the EMB-1200 is divided into three chambers; between two of them is a long-throw 12" woofer with a 15-lb magnet. The central chamber creates critical damping of the powered internal driver, to deliver fast rise and decay times. The front chamber couples the woofer's output to the external aluminum diaphragm. The EMB-1200's 1200W amplifier has twice the output required for it to reach full volume. Internal equalization allows the system to reach down to about 20Hz. The rear panel holds the line-level RCA input and output jacks, as well as high-level speaker binding posts when using the output of a power amplifier. A switch allows the use of a low-pass filter rotary control to diminish the subwoofer's upper-frequency output, or bypasses the crossover altogether. Other features on the rear panel include a phase switch (0 degrees or 180 degrees), and an IEC socket for the power cord. James Loudspeaker's goal for the EMB-1200 was to design a small, powered subwoofer that could handle, without huge amounts of distortion, the deep-bass pulses found on DVD soundtracks. Whether reproducing the thunderous avalanche in Ice Age, the hull rumblings in U-571, or the pulses of the torpedo motors in Pearl Harbor, today's subwoofers are challenged well beyond what they might encounter from a two-channel music system. Cost-effective servo systems will work up within their dynamic-range limitations, but peaks can be compressed. In addition, when the typical servo used in a small sub reaches its correction limit, this can produce odd noises that are much more disturbing than the usual types of distortion. James Loudspeaker set out to provide acoustic solutions that would minimize distortion while still allowing the subwoofer to clip gracefully when hit with an unmanageable sound effect. Distortion in the EMB-1200 is controlled by the sub's bandpass design, which is similar to those of theIsophon Europa or KEF Reference 107 loudspeakers. The active woofer is mounted completely inside the enclosure. The diaphragm that communicates with the outside world is actually a passive radiator. The passive woofer is not driven by an electrical signal but is air-coupled to the active woofer. The passive radiator's resonance frequency is designed to be in the middle of the system's passband, not at the bottom, as might be found in a bass-reflex system. For the EMB-1200, this resonance point is 45Hz, about the middle of its flat frequency-response range of 25-120Hz. At the resonance frequency, the "lump of air" between the two diaphragms presents a stiff barrier to the active woofer, which will therefore appear to be standing still while the radiatior moves vigorously. This resonant point effect, which James describes as "energy multiplication," keeps the active woofer's excursion to a minimum in this region, limiting distortion not electrically but acoustically. At the resonant frequency, the driven woofer moves only about a tenth as far between 35 and 45Hz as it would at other frequencies. The result, says James, is lower distortion, greater output in the band where bass energy is concentrated, and increased dynamic headroom. Wiring up the EMB-1200 was simple. No high-pass filter was involved, which meant that inserting the EMB-1200 in my system involved simply running an interconnect from my preamp's secondary Main Out jacks to the EMB-1200's line-level RCA inputs. Placement was also simple: I put the EMB-1200 where the Velodyne DD-18 had done best—in the right corner of my room, behind the two Quad ESL-989 loudspeakers I use for most of my music listening. The Quads were positioned 5' from the rear wall, 8' apart, 3' 9" from the side walls, and slightly toed-in. My listening chair was 10' away, facing the Quads. This system sat near the short wall of my lightly damped, rectangular (26' long, 13' wide, and 12' high) listening room. Behind the listening chair, the other end of the room opens into a 25' by 15' kitchen. To match levels among the speakers and to choose filter frequencies that would give the smoothest overall response, I set the Velodyne DD-18 subwoofer's calibration microphone on the back of my listening chair at my ear level: 37" from the floor. I adjusted the EMB-1200 using the Velodyne DD-18's built-in signal generator, microphone, and onscreen spectrum analyzer. (The DD-18's woofer was shut off by setting its volume to "0.") I fed a small TV set from the DD-18's Video Out jack to display the DD-18's System Response screen. The DD-18's signal generator repeatedly sweeps a test tone from 20Hz to 200Hz; I fed this into my preamp's tape input to drive my overall audio system. The sweep signal reproduced by the James subwoofer was picked up by a microphone placed on the back of my listening chair. With the sweep signal running the full 20-200Hz spectrum every three seconds, I set the EMB-1200's gain control to provide the best match with the Quads. This was found at about +4, or 10 o'clock on the EMB-1200's gain dial. I then adjusted the phase and low-pass filter points to achieve the flattest frequency response at my listening chair. Without the subwoofer, the Quads' frequency response showed a dip at 60Hz and a peak at 40Hz, with rapidly declining response below 40Hz (fig.1). I found the flattest response by setting the EMB-1200's Phase control to 180 degrees and its low-pass filter to 85Hz. 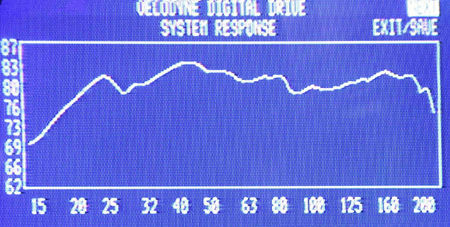 The overall system frequency response was then 20-200Hz, ±4dB (fig.2). Fig.1 Quad ESL-989, in-room response without subwoofer. Fig.2 Quad ESL-989, in-room response with James EMB-1200 subwoofer. The EMB-1200 blended well with the Quad ESL-989s, yielding a seamless integration of the midbass and lower bass. For example, the bass notes on Mary Gauthier's Filth and Fire (CD, SIG 1273) were more taut and solid with the EMB-1200 in the system. The dreaded midbass emphasis produced by poor subwoofers was totally absent with the EMB-1200, which rendered a cleaner, bettre defined impression of the midbass and up. In addition, the EMB-1200 had the muscle to move lots of air in my large listening room when the occasion demanded it. This was proven time and again. Track 7 of the Patriot Games soundtrack (CD, RCA 66051-2), "Assault on Ryan's House," is a torture test for subs as it contains an overabundance of unusually thick bottom-end information. But the EMB-1200 was unperturbed and uncovered quite a bit of music down there, which added immeasurably to the realism of the sound. The EMB-1200 played the passage with no sign of distortion or stress. The bass remained clean, deep, and solid, with no spurious noises to indicate that the woofer was in difficulty. The EMB's speed and agility rendered dynamics with suddenness and explosiveness. The churning electric bass, drums, and synthesizer opening to Emmylou Harris' "Deeper Wells," from her Spyboy(CD, Eminent EM-25001-2), was delivered in full fury, each instrument clearly differentiated, while Harris' delicate soprano was clear and undisturbed. This selection overwhelmed the smaller EMB-1000, as it does many subwoofers. Not the EMB-1200. The EMB-1200's power handling and excellent pitch definition really paid off when reproducing film soundtracks—the sub generated the ambience and atmosphere the filmmakers were attempting to convey. For example, the EMB-1200 captured the dense, sodden synthesizer, otherworldly Tibetan temple horns, and the deep, hallucinogenic chants of the Gyuto Monks in "Sand Mandala," the opening of Philip Glass's soundtrack for Kundun (CD, Nonesuch 79460-2). In "Caravan Moves Out" on the same disc, delicate plucked harp notes and Tibetan temple cymbals were contrasted with powerful churning Tibetan horns, synthesizer, and double bass to convey the glacial progress of the plodding caravan. Similarly, the EMB-1200 reproduced the thunderous, deep, massive synthesizer notes that open the "The Carnotaur Attack," from the Dinosaur soundtrack (CD, Walt Disney 50086 06727). It also captured the subtle but tuneful repeated bass-drum strokes in "Cosmos...Old Friend," from theSneakers soundtrack (Columbia CK 53146). The deepest notes of the pipe organ, its pedal pipes, were reproduced with pitch-perfect weight and authority. The EMB-1200 revealed the characteristic sounds of the large pipes of different organs. There was soft, blurry power in Elgar's The Dream of Gerontius (Test CD 2, Stereophile STPH004-2); the final, thunderous chord of "Lord, Make Me an Instrument," from John Rutter's Requiem (CD, Reference RR-38CD); the violent pulses during Gnomus, from Jean Guillou's transcription for organ of Mussorgsky's Pictures at an Exhibition (CD, Dorian DOR-90117); and the stair-step pedal scales of organist E. Power Biggs with the Philadelphia Orchestra in Saint-Saëns' Symphony 3, "Organ Symphony" (LP, Columbia MS 6469). In addition to its ability to generate bass, the James EMB-1200 enhanced the Quad's imaging and portrayal of space. It was more than just adding bass extension—it increased my system's transparency from top to bottom. The lack of a high-pass filter had audible effects in my system. During setup, I had to tune the EMB-1200's low-pass filter to a high 85Hz to get it to blend with the Quad ESL-989s. Other satellite speakers might work better with a lower low-pass filter point. In my room, the higher filter point made the EMB-1200's bass directional and localizable. By contrast, the Velodyne DD-18's ability to blend with the Quads at a low-pass filter point of 40Hz made its position less detectable sonically. The DD-18 had slightly more pitch definition in some selections, perhaps because its high-pass section filtered out demanding bass signals from the Quads, while its built-in parametric equalizer meant it could be more closely tailored to my room. The effect of this directionality was best heard on single struck bass notes, such as: the concussive drum whack at the end of John Williams' Liberty Fanfare on Winds of War and Peace (CD, Wilson Audiophile WCD-8823); during the explosive bass blips that churn out of Morton Subotnik's Wild Bull, composed for synthesizer (LP, Nonesuch H-71208); and during the frenzied, explosive timpani strokes of Yoshihisa Taira's Hierophonie V, from The Kroumata Percussion Ensemble (CD, BIS CD-232). Orchestral bass was less directional. The EMB-1200 did a masterful job of reproducing the powerful, throbbing mix of bass drum and timpani in Stravinsky's The Rite of Spring (CD, Reference RR-70CD), as performed by the Minnesota Orchestra under Eiji Oue. Despite my caveats, I greatly enjoyed the EMB-1200's ability to deliver the sock, slam, drive, and pulse of percussive bass—these were second to none. The EMB-1200 demonstrated transient fidelity and an absence of overhang in Michael Arnopol's standup bass introduction to Patricia Barber's "Use Me," from her Companion (CD, Premonition/Blue Note 5 22963 2). The EMB-1200 emitted not a scintilla of boom or bloat, but a lean, driving power. I heard the same characteristic punch of plucked double bass in a close-miked recording of bassist Charlie Haden and harpist Alice Coltrane, playing "For Turiya" on Haden's Closeness (LP, A&M SP-710). David Hudson's massive didgeridoo throbbed and burned during the first track, "Rainforest Wonder," of his Didgeridoo Spirit (CD, Indigenous Australia IA2003 D). And what of Harry Partch's volcanic Marimba Eroica? That old vinyl recording delivered the deepest, most solid bass sounds heard during my reviewing sessions, and rattled loose objects all over my listening room. Sitting 1m away from the EMB-1200 on my wooden floor, it rattled me, too—my backside was rippled through by Partch's art form. Well done, Harry! 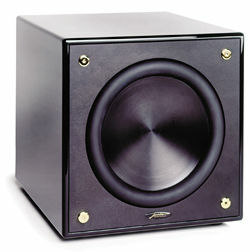 The James Loudspeaker EMB-1200 subwoofer has great build quality, and is priced right at $2195. Better yet, it's not just another "wonder cube." Acoustical theory has been implemented so well in this relatively small subwoofer that its bass output and dynamics rival those of subs with larger, more expensive enclosures—even without servo correction. In my system, the EMB-1200 delivered ample deep bass while widening and deepening the soundstage. It moved lots of air in my large listening room, played a wide range of music without favoring any part of the bass region, and stayed out of the way of the midbass and midrange. The EMB-1200 was too directional with percussive music when its crossover was set to the frequency where it best blended with my Quads, although adding a high-pass filter would have minimally raised its cost and would not have altered the James' compact cabinet size. I'd wager its ability to play taut deep bass with good pitch definition will make it a welcome addition to most high-end two-channel music or multichannel home theater systems.